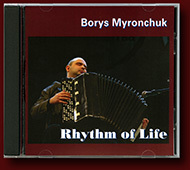 All pieces are composed and performed by Borys Myronchuk. All pieces from the CD are available as sheet music! Why "Rhythm of Life"? Because, first, music by Borys is very rhythmical, second, every part of his Jazz-Rock Partita has several lines of words where he tells what it is about. Mostly, it's about life and its rhythm. Jazz-Rock Partita was composed with one breath. Music is highly intensive, modern, jazzy, and, what is most important, it stays music! You can’t stop listening to it again and again. Joy, passion, sadness, eternity – everything’s there. Concert Suite on Latin American Dances consists of three pieces, which were composed in different years. Of course, they can be played and listened to separately. The pieces are result of author’s admiration of the stunning rhythms and beauty of Latin American music. Slavic soul, astonishing rhythms, technical perfection, special effects which resemble the whole band of percussion, - all make the music and performance by Borys Myronchuk brilliant and unforgettable.